Root canals seem to have gotten a bad rap over the years, perhaps due to exaggerated stories, fictional movies, and the fact that not many people actually know what root canal treatment is. 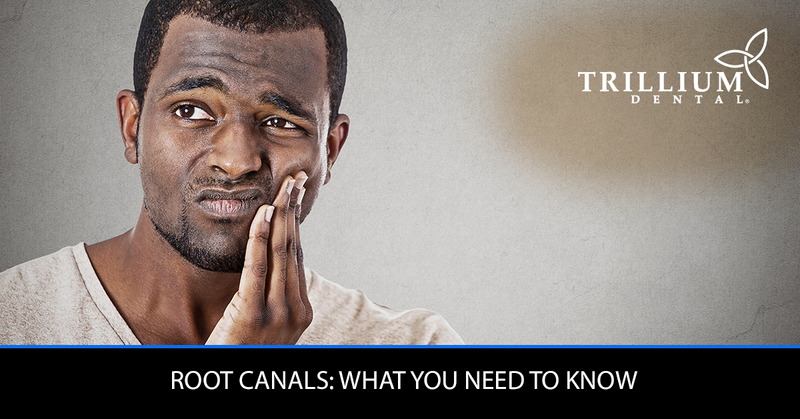 Obviously, root canals aren’t as scary or painful as the dentist in Finding Nemo makes them seem, so our team at Trillium Dental in Ottawa is here to debunk some common myths about root canal therapy and tell you everything you need to know before you visit our dental clinic for a root canal. First and foremost, the purpose of root canals is to remove the pulpy center of an infected tooth in order to save the tooth itself from deteriorating or falling out. To do this, your dentist will first numb the area with a local anesthetic and apply a dental dam to keep the site free of saliva and bacteria. Then, they will drill a small opening at the crown of the tooth (remember, the area is numb) so they can gently remove the infected or damaged nerve. Once the pulp has been taken out, your dentist will clean out the cavity and insert a synthetic nerve replacement to fill in the space and support the tooth before resealing the hole. To complete the root canal treatment, your dentist will seal the hole with a dental filling and send you on your way! As previously mentioned, lots of people seem to be under the impression that root canals are an incredibly painful dental procedure — however, this is not always the case. After all, a local anesthetic is applied to the area well before your dentist starts drilling, and even then, all you’ll really feel is a little vibration. Any pain you experience from a root canal treatment will likely be after the anesthesia has worn off, which you can remedy by taking iBuprofen, aspirin, or any other kind of over-the-counter pain medication from your local drugstore (in moderation, of course). In most cases, any lingering pain from a root canal treatment will wear off in just a few days if you maintain good brushing and flossing habits. Most dental professionals will tell you that tooth extraction is their last course of action, and that they would much rather save your natural tooth. This is because teeth are much easier to save than replace (unless you want dental implants or a partial denture), especially if the issue is an infected nerve that can be removed in a single dental appointment. The fact of the matter is that if bacteria finds its way into the nerve of a tooth (via a crack, cavity, or broken filling), it will attack and destroy the pulp, which cannot repair itself. This bacteria can even infect and weaken the tooth itself, leading to tooth decay and potentially a missing tooth. Obviously, the best way to avoid this is by being diligent about brushing and flossing your teeth, in addition to visiting your local dentist for bi-annual teeth cleanings and x-rays. However, these nerve infections can still happen when you least expect them, and it’s best to catch them early so you can remedy the situation before it’s too late. That’s why we offer a range of restorative dentistry procedures here at Trillium Dental — our mission is to do whatever it takes to save your teeth, even if that means removing a damaged nerve or applying dental crowns or dental bridges. Anyone in the field of family dentistry will agree that nothing is better than having natural teeth, even though there are other options out there like same-day dental implants. At the end of the day, root canals aren’t as big a deal as many people make them out to be, as the procedure is quick and recovery time is short. Plus, the anesthesia eliminates most (if not all) of the pain during the treatment, which means that you can have the damaged nerve removed and the cavity filled without feeling any pain at all. That being said, it’s still good to have some over-the-counter pain relievers on hand for a few days after the root canal so you can offset any pain you experience as your tooth recovers. If you are experiencing any of the symptoms of a damaged or infected nerve mentioned above, be sure to visit your local dental clinic as soon as possible. While you could be experiencing a minor toothache, it is still worth it to make sure you don’t have an infected nerve that will turn into a larger problem down the road. Contact us today to learn more about root canal treatments, and book your dental appointment at Trillium Dental in Ottawa!